Did you know that Mandarin Chinese is the world’s most widely spoken language with over one billion native speakers? Once you get the basics down, you’ll be surprised how quickly you’re able to begin speaking it. And even knowing a little bit of the language will make travel to China far easier, and much more fun. Whether your goal is to travel, communicate with friends or colleagues, reconnect with family, or just understand more of what’s going on in the world around you, learning to speak Mandarin Chinese will expand your horizons and immeasurably enrich your life. The best part is that it doesn’t have to be difficult or take years to master. Thirty minutes a day is all it takes, and we get you speaking right from the first day. Pimsleur courses use a scientifically proven method that puts you in control of your learning. If you’ve tried other language learning methods but found they simply didn’t stick, then you owe it to yourself to give Pimsleur a try. 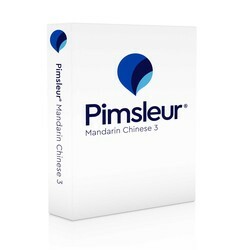 Builds upon skills taught in Pimsleur’s Mandarin Chinese Levels 1 and 2. In the next 10 lessons, your skills will demonstrate ever-increasing mastery. Speaking with grace and complete naturalness, you’ll enjoy fluid conversations on many new subjects. Delving deeper into cultural norms and situations, you’ll find yourself responding effortlessly, and able to choose from a wide accumulation of vocabulary and structures. In the final 10 lessons, you’re nearing fluency with agile responses, and a natural sounding, near-native accent. You’re able to utilize the language in subtle ways, and speak using past, present, and future tenses. Self-confidence soars as you no longer experience the language and culture as a foreigner, but as someone with deepening insight into the language and culture. In Level 3, you'll continue to practice reading Hanyu Pinyin (pinyin for short) the official phonetic system for transcribing pronunciations of Chinese characters into a Latin alphabet. Twenty reading lessons are included and will build upon the pinyin reading skills acquired in Levels 1 and 2. These lessons are designed to give you practice reading and to provide new vocabulary. Over one billion people speak Chinese. The two most common dialects are Mandarin and Cantonese. They are not mutually intelligible. Mandarin is the official language in Mainland China, Taiwan, and Singapore. The Mandarin dialect is used in most Chinese schools, and in most TV programs, movies, and radio stations throughout the country, even in Guangzhou (formerly Canton), where people speak Cantonese in their daily lives. Mandarin is one of the six official languages of the United Nations.